As soon as this phrase came out of Natalia’s mouth, life changed for the better and for the worse. For the better since she was getting a new, adorable puppy; however, for the worse since she didn’t know what she was getting herself into. Honestly, the puppy did look quite innocent and too cute to handle that anyone, SERIOUSLY anyone, would love to take home that one certain dog. Those puppy dog eyes, that golden brown fur, those pointed ears, and those fiery eyes: what was not to like about the dog. Everything seemed perfect on the outside of the dog to Natalia that no other dog would change her mind. Her mind was already set; there was no turning back now. Prancing around the house, Natalia was thinking of names for her new dog. Isabella was too girly. Tiger was too wild. Daisy reminded her too much of a flower. Katniss? Katniss. Natalia liked the feel to that name. It reminded her of the brave, fighting Katniss Everdeen from The Hunger Games. She already knew from first glance at the pound that her dog would be bold and fitting to the attributes of Katniss herself, so why not give her a name that suited her. Natalia chose the right name in fact. One day, robbers attempted to steal valuable jewelry and money from a safe hidden in Natalia’s house. However, they failed since Katniss bit one of the robbers and scared the other ones away. Katniss was truly an honorable, loyal dog until the day came where things began to go south. Natalia began to notice a change of pace with Katniss, in which Katniss began to bite people that meant no harm. Natalia scolded Katniss each and every day until there was one certain day that Natalia noticed that her dog disappeared. With all the bad stuff happening with her dog’s behavior, Natalia didn’t know what to do and broke down in tears. While her family decided to put up “missing dog” posters around the neighborhood, Natalia stayed at home with the TV on the news, hoping for Katniss to pop up on the screen. However, of course, Natalia knew that lost dogs didn’t really appear on the news, so she just cried to herself while faintly listening to the voices on the television. Natalia knew at this point that by “one of us” the robber meant a being that only thought about evil. Within this moment, Natalia didn’t know what to feel. She felt as if the world was falling apart each second she pondered on what to do. But then again, it was literally falling apart since Katniss had one mission: to destroy the city. No longer thinking, Natalia ran out the door and headed straight towards the chaos. As she was speeding 100 miles per hour to get to Katniss, she saw from afar those fiery eyes that were once so innocent. However, now, they were tearing apart the buildings with no mercy left behind. It was time for Natalia to face her fears and to see if her dog’s loyalty was true to her master. Natalia yelled, “STOOOP KATNISS, PLEASE!” Her now ginormous dog then glanced at Natalia with her laser eyes, slowly bringing down each building with a single turn of her scruffy face. Natalia then looked at Katniss with puppy dog eyes that imitated Katniss when she was first adopted at the pound. Furthermore, Natalia uttered, “Much love, wow.” With these words, the beams from her dog’s eyes began to retract until it fully disappeared. All it took for Natalia’s dog to come back was those three words. Katniss began to shrink until she returned to her normal size, and her behavior began to change to who she used to be: the once loving, adorable, and loyal dog. Such wow, much doge. There once was a little shiba inu named Max. He was an ambitious little dog from the pound who just wanted to be adopted. Max was very young when he was brought to the pound and he does not have any other memories before that. Max was about 7 years old and has seen many other dogs come and go. Now he was just waiting for hit turn. One day he was taken out of his kennel by an older couple. At last, he thought he was going to be adopted. The couple proceeded to examine him and even though they first looked at each other with disagreement, the couple decided to take Max home. Max was very excited and he couldn’t stop wagging his tale with excitement. When the elderly couple came home, they proceeded to open the door and there Max saw a little boy. As soon as Max got close to the little boy, the little boy began screaming and shouting at hitting Max. Apparently, the boy wanted a daschund and not Max. The little boy ended up bring Max outside of the house and made him run away. Without food or shelter, Max was shunned from what he thought would be his brand-new owners. Max was very upset and began to cry in a dark alley all alone. A few days had passed and Max was starting to feel faint from the lack of hunger. Max felt like this was going to be his last day. His only regret was that he could not find a new family to call his own. Max’s eyes then shut and it seemed that Max was dead. Out-of-nowhere Max suddenly began to grow. His growth ended with him being even large then most buildings in the city. Max did not know what happened since he thought he was going to die but now he was feeling well. When he howled, glass shattered and buildings began to fall. Max felt excited and suddenly laser beams shot out of his eyes. Max was worried he was destroying the buildings around him but then he remembered the little boy and his family and how he was beaten and kicked out of the house mercilessly. Max decided to use his powers to get revenge on the human who did not want him. Max then proceeded with his vengeance and continued to destroy the rest of the city. Maybe one day Max will can feel the love and comfort he dreamt of when he was a kid but for now the world shall feel his wrath. There was once a Shiba Inu named Kabosu. He lived most of his life alone having been abandoned on the streets of Tokyo at a very young age, but he never felt lonely. Wherever he went, people always treated him kindly. Strangers always pet him and gave him snacks because they couldn’t resist the adorable dog that confidently wandered the streets. He loved the freedom and attention he got from being a stray dog and actually felt bad for domesticated pets. One day, however, he found himself drawn to a friendly looking woman who had dog biscuits to offer him. Usually when people offered him snacks, it wasn’t dog snacks and they would just hand him their leftovers, so he was excited to see he would get some of the fancy stuff today.To Kabosu’s dismay, the woman turned out to work for an animal shelter and he soon found himself trapped in a world of vets and confined spaces. On the bright side, Kabosu didn’t have to stay in the animal shelter very long. A kindergarten teacher, Atsuko Sato, couldn’t resist Kabosu’s cute, expressive face and took him home. Atsuko knew that Kabosu was a special dog – he was more independent than most dogs and his facial expressions resembled those of human’s. Wanting to share just how special Kabosu was, Atsuko photographed a series of Kabosu’s facial expressions and posted them on her personal blog. Shiba Inus have now been subject to all kinds of jokes after becoming a meme. Owners started to smother their Shibas with even more attention, recording and posting their dog’s everyday antics for views. Kabosu is no longer the only famous Shiba, as other Shiba Inus now have their own Instagram accounts and made the subject of everyone’s attention. Some dogs are now even being forced by their owners to travel around the world to take photos with their fans. Most Shibas did not enjoy their newfound fame and would much rather go back to their days of staying at home and living simple lives. Shibas from all over the world started to talk to other dogs, spreading the word about how Kabosu and his owner is to blame. The Shibas eventually teamed up to create the “Much Destroy, Wow” movement. One Shiba went out of his way to act out against its owner so that a dog whisperer would be called in to help. That Shiba described the movement to the dog whisperer in hopes that he would help spread the word to humans. As a result, the dog whisperer asked an artist to create a piece of art that would help the Shibas in their cause. 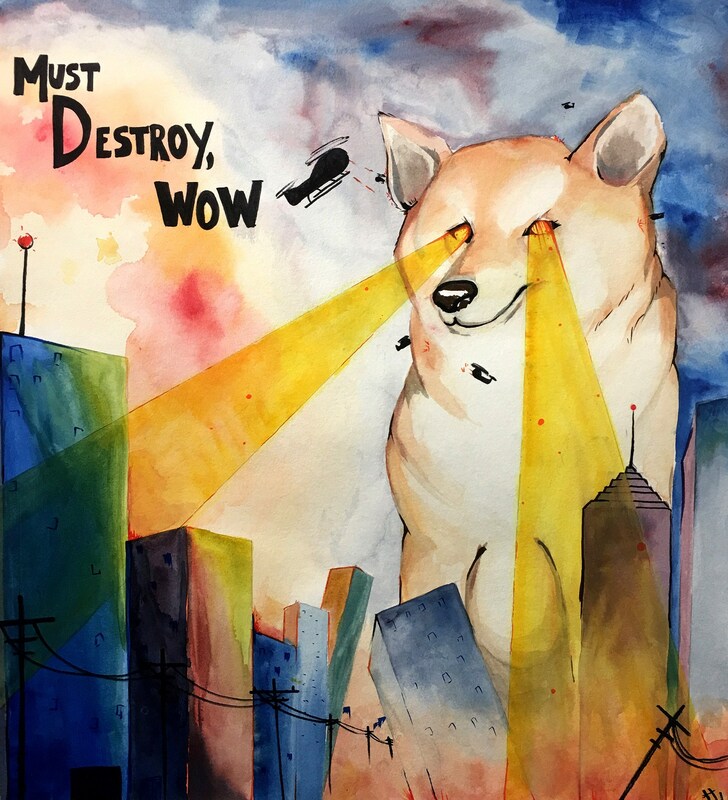 That piece of art is pictured above, and shows a Shiba Inu destroying Tokyo – Kabosu’s hometown – as a message for both Kabosu’s owner and other owners to stop the spread of Doge memes. The Dog Pound, a city were dogs were allowed to live with one another without any threats from anyone or anything. It was very peaceful and the last time something bad happened was when a group of rottweilers caused a ruckus and decided to attack other dogs at night. It has since calmed down a bit due to the increase in dog police. One day, a Shiba was born and was abandoned by his mother. He was eventually found by a wild pack of aliens that can manipulate shape, powers, etc. After being raised from a newborn to an adult, the aliens decided they should test his powers since he has now matured a bit and can control it better. They decided to give him the power to grow in size and shoot lasers out of his eyes, but first, he had to train and master his powers. Through months of vigorous training with the aliens, he finally decided it was time. He traveled on his four paws to the city where his mother abandoned him and wanted to wreak havoc. He decided to transform into his final form and began shooting lasers at anything he saw. With his big body, it came with a bigger bark. When his mother heard his bark she instantly knew it was her son. She finally found the courage to go from her hiding spot to embrace her son in order to save the city. She showed herself to her son and barked as loud as she could from the top of her lungs. The Shiba noticed it was his mother and froze for a second. Within that second, things changed. The dogs in the helicopters shot tasers and snipers hiding in rooftops all shot at the same time. The Shiba was quickly contained and the situation calmed down a bit. As a result, the mother technically saved the city from disaster, but she realized that her son is now in danger. The dog government is going to cut him open and try to discover how he was able to grow so huge and use it for their military. The mother decided to try and find the people who made him so big. She journeyed to the spot where she abandoned her son and saw marks of aliens. As she backtracked the footprints, she eventually found the lair of the aliens, hiding in the sewers of the Dog Pound. She begged them to help save him but they repeatedly declined, due to it not being in their nature to save dogs. When the aliens fell asleep, the mother went inside the lab to steal their equipment and used it on herself to gain the same powers as her son. She hurried to the government without any slight training, which was a very bad move. She rampaged through the front door and started shooting lasers everywhere, but she did not know how to control it, so as a result, she shot a laser through the floor and it happened to kill her son. She fought and fought the government until she came down the basement, where she discovered a dead shiba laying on the test table. She was so furious at herself because she saw the laser marks on his body. As a result, she looked into the mirror and shot a laser, which bounced back and killed her immediately. It had been an average day, no different from any other. Nell had woken up, sung karaoke in the shower, gotten a quick breakfast, and headed to work. Nothing had seemed out of the ordinary to her, save for all of the radio stations being too scrambled to listen to…but that didn’t seem abnormal to her at the time, just inconvenient. Even as she drove her tiny Ford through the streets, through the conspicuously light traffic, she still did not question what was going on. Perhaps this was just good fortune with a minor sacrifice? No traffic to speak of, but no music? She could live with that. She could feel the vibrations throughout the car, could see the water in her Evian bottle pulsate every few seconds…a steady rhythm. Shakily reaching for the handle, Nell got out of her car and looked anxiously around. Was this an earthquake? Where should she hide? Could she even hide? Her frantic thoughts were drowned out by a tumultuous BORK. Revolving on the spot, she saw it, padding toward her; a dog the size of the Chrysler building. She let out a scream, which caught the dog’s attention. It bound over to her in two leaps, giving Nell no time to escape. The loud noise it made was too high of a decibel for Nell to handle. Blood leaked from her ears, sliding between her fingers as she tried to box out the sound with her hands. Dropping to her knees in pain, she wailed, but the kaiju dog only took her movement for playtime. Reaching out a massive paw, the dog began to bat at her, sending her body tumbling into a mass of debris like a ragdoll. Then, with one final blow; the dog dropped it’s massive paw upon Nell, ending her torture. The dog borked again.